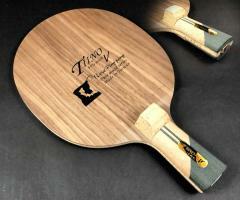 【I Love Ping Pong Work Studio】Production + Coach Tony Hsu research and development design supervision. Coach Tony Hsu specially selected racket reputation is worthy of your use. This walnut 5 clip has been tested for various layers of thickness for 5 months. The structural specifications allow the speed and rotation to be sent to the best balanced performance, and the stability has an absolute control feel. Coach Tony Hsu regards P.P. supplies product as a kind of good [tool] And the [not the merchandise] insists that the quality of the table tennis racket produced will definitely satisfy you. Thanks to all the T.T. user for their brave attempts to use the new brand [PP], all the supporters who have appreciated the support since the listing! It is our [PP] brand quality excellence and continuous growth of the best force! Thank you for your trust and support! [SCST] coating synthesisface material features: The surface material is specially coated to make the walnuts more closely combined, which can strengthen the attacking force of the bottom plate, and can easily remove various glues, reduce the possibility of wire drawing and extend the service life of the racket.